In a large bowl, beat cream cheese until smooth. Beat in 1 cup peanut butter and sugar. Fold in 3 cups whipped topping; spoon into crust. In a microwave-safe bowl, heat 2/3 cup hot fudge topping for 30 seconds. 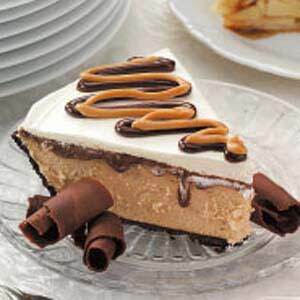 Pour over peanut butter layer and spread to edges of crust. Refrigerate for 2 hours. Spread remaining whipped topping over pie. Cut into slices. Place the remaining hot fudge topping and peanut butter in two separate plastic bags. Cut a small hole in the corner of each bag; pipe topping and peanut butter over each slice of pie. Makes 8 servings. . . .